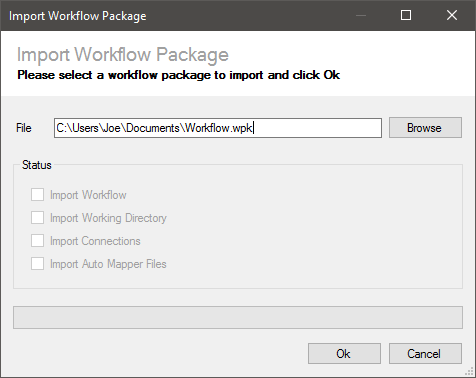 Zynk provides functions to import and export workflows and their data using a single workflow package file, which can easily be moved from one PC and another. For example, you may need to move a workflow when deploying an integration to a live environment. Any XSL transform files used by Auto Mapper tasks in the workflow. Any truth table data as seen on the Data tab. Enter file to save the workflow package to, or use the Browse button to select this. Click the Ok button to start the export. Once the export is complete, a confirmation message will be displayed. 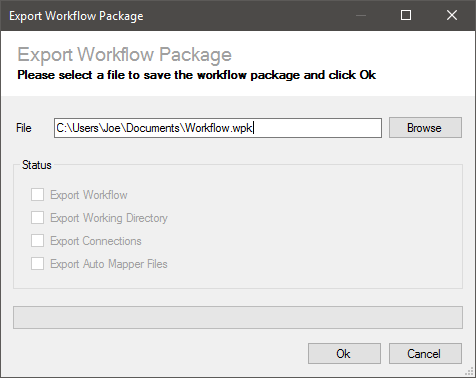 Enter the workflow package file, or use the Browse button to select it. Click the Ok button to start the import. Please note that if a connection contained in the workflow package file already exists, it will be overwritten automatically without warning. Once the import is complete, a confirmation message will be displayed.